Forest Song through our Director, Carol Bylsma, can provide Professional Development opportunities for educators at schools, school districts, and in non-formal settings. 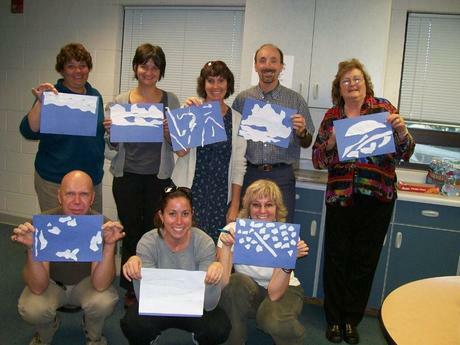 Our emphasis is science and outdoor education for K-12 teachers and other educators. Our Professional Development programs can be tailored to your situation; however, each program promotes inquiry-based learning, critical thinking skills, and knowledge to make informed decisions as a part of being a citizen of the United States of America and a global citizen on our planet. GLOBE is a worldwide hands-on, primary and secondary school-based science and education program. GLOBE's vision promotes and supports students, teachers and scientists to collaborate on inquiry-based investigations of the environment and the Earth system working in close partnership with NASA and NSF Earth System Science Projects (ESSPs) in study and research about the dynamics of Earth's environment. Announced in 1994, GLOBE began operations on Earth Day 1995. Today, the international GLOBE network has grown to include representatives from 111 participating countries coordinating GLOBE activities that are integrated into their local and regional communities. Due to their efforts, there are more than 50,000 GLOBE-trained teachers representing over 23,000 schools around the world. GLOBE students have contributed more than 20 million measurements to the GLOBE database for use in their inquiry-based science projects. GLOBE brings together students, teachers and scientists through the GLOBE Schools Network in support of student learning and research. Parents, Scientists and GLOBE Alumni also support students' engagement in GLOBE. GLOBE is most appriopate at the middle school and high school level in science, geography, and technology. - Nobel laureate Dr. Leon Lederman. Through a combination of tried and proven techniques and materials, including already available curricula or something customized just for your needs, the goal is for all kids to be active and motivated learners learning to think critically and explore their creativity and curiosity. Providing Professional Development for teachers gets the program selected off to a solid start. Follow-up visits to mentor, re-teach, model and generally assist each teacher makes the program selected work. Watch your school's test scores soar in science, reading and writing and math too. We can suggest curricula ready to use or develop materials specific to your needs. Each workshop is exciting, inspiring, and FUN! Carol Bylsma has developed several presentations on a variety of topics including pollinators, xeriscape gardening, wintering Monarch butterflies, wildlife and more. Leading walks and hikes outdoors and assisting educators and other interested folks in techniques to lead their own outddor experiences is always a fun and rewarding day for all including Carol Bylsma. Carol places a butterfly on her nose! I's a butterfly kiss!